I came across a video a few weeks ago that brought a big smile on my face and I have been waiting for the opportunity to embed it into a relevant post. If you have seen the Google Chrome ad on various media featuring the marvelous bread fish then you are familiar with Mr. Weebl’s work. He created this video called Shrimp. 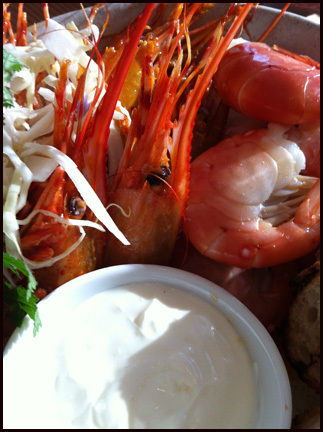 It’s apropos for this post because it’s spot prawn season here in BC. Thanks to fmed (@wisemonkeysblog), I learned that the tasty spot prawns I look forward to each year are actually shrimp and not prawns (http://en.wikipedia.org/wiki/Pandalus_platyceros). (I apologize in advance if Shrimp Glockenspiel gets stuck in your head). For this year, I wanted to go to a non-Asian restaurant to have Spot Prawns, err shrimp; I wanted something different. I decided to head to Burdock & Co to try their Spot Prawn (Shrimp) boil this year. When I learned more about Chef Andrea Carlson, reviewed the menu for Burdock & Co and double checked the address for the restaurant – the only word that popped into my head was Juxtaposition. A high end Chef serving what appears to be high end food in a working class neighbourhood. Among the items on the limited menu, the theme carried on with what most would consider tasty but inexpensive items like Ramen and Fried Chicken listed with highfalutin entrees like oysters paired with finger lime caviar. I was very curious about Burdock &Co. I gathered some friends and we ended up splitting 5 dishes and a dessert for a dinner after work. The first thing ordered off the menu was the Spot Prawn Boil. The dish was 6 tender, sweet and perfectly blanched beheaded spot shrimp, while the heads were served fried. Yogurt and crispy bread completed the plate. The sour yogurt provided a nice contrast with sweetness of the shrimp. The bread was nice to mop up the shrimp juices and the innards of the heads. 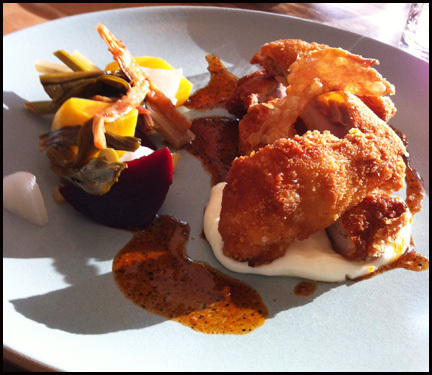 Next up was the fried chicken and pickles plated with crispy chicken skin and charred chili vinegar. Unfortunately the pickles that came with the chicken had pickled asparagus. In addition to not being able to handle spicy foods I can’t eat asparagus either – I developed late onset allergies to them. My friends liked the pickles, though. The chicken had a crispy coating and juicy on the inside. The lemon mayo and charred vinegar were great condiments for the chicken. The wheat berry risotto with sun root, mustard greens, castelvetrano olives, farmhouse fermiere and smoked crema was my favourite item of the night and I wanted to order another plate for myself. 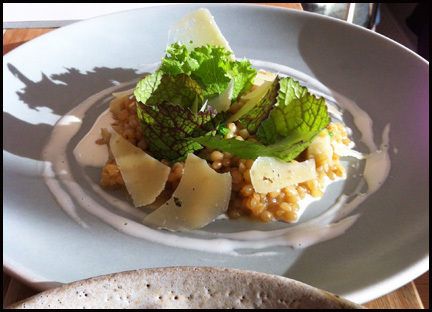 The crunchy texture of the wheat berry, seemed rustic in comparison to the sophisticated creaminess of the dish. The mustard green helped offset the dairy component with its bitter flavour. The olives add texture and saltiness. The sunroot added a soft texture to the wheat berry mixture. All the flavours and textures just worked for me and I really enjoyed the risotto. All food at Burdock & Co are meant to be shared. However I don’t recommend sharing the ramen. Trying to evenly split the pork belly ramen in the 3 bowls, our friendly server brought us was a bit of challenge, especially the sunny side up fried egg. No matter what we did someone got more candied bacon, nori, greens and soup. The noodles were al dente. The pork belly was fantastic: tender and rich served in a of block meat instead of the traditional slices. 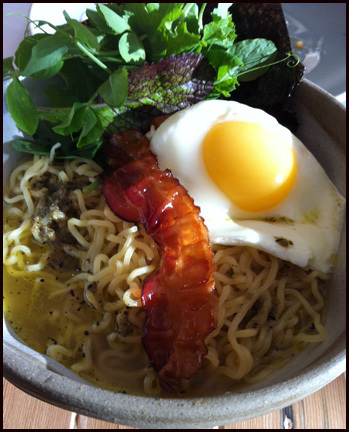 The egg added more richness to noodles. Despite the sharing issues, the warm ramen bowl, perfect for winter, topped with spring greens of pea shoots and mustard greens was delicious. I just wish I got more soup to savour. The last savoury entrée we ordered was the halibut. The perfectly seasoned and cooked fish was placed on top of tender radish and hop shoots. A pine mushrooms and burdock tea pooled around the halibut, while fried slivers of burdock and hop salt garnished the top of the fish. The tea was earthy tasting and contrasted well with the Halibut. Overall it was a well prepared and beautiful plated dish. 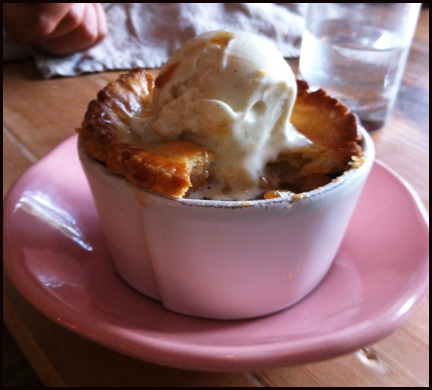 Our salted caramel apple pot pie served with a scoop of vanilla ice cream was a sweet end to our wonderful meal. The salt amplified the sweetness of the filling. The apples still had some texture but were soft. Normally, I don’t comment on value or service but I will in this case given some of the negative reviews in regards to both. I think given the technique involved and the freshness of the ingredients, the non-seafood dishes and the halibut I feel are fair value. 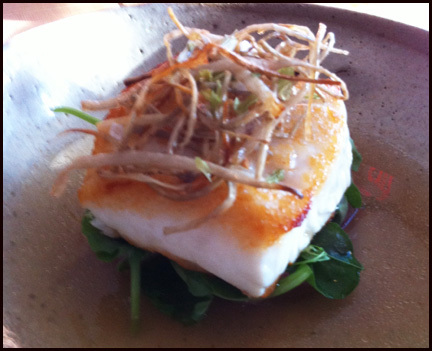 At first I was on the fence about the halibut, but as I recalled the halibut I had at Blue Water (my non Asian standard barer for seafood) I think you would get the same quality, maybe 60% – 75% more food but at least double the price (if not more). The only issue I found in terms of value was the spot prawn boil. For $24 I felt maybe 8 shrimp would have been fairer value. Fortunately spots prawns are seasonal so this menu item won’t be an issue as it should be replace once the season is over. In terms of the service, our waiter was friendly, attentive, explained every dish and accommodated all our questions. I just feel that Burdock & Co may be getting a bad rap simply because it’s so different than the restaurant in its vicinity in terms of the food there are serving. 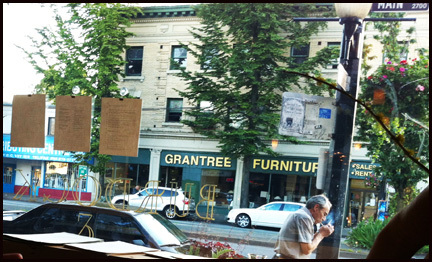 If they opened in Gastown, Kits or Yaletown, I honestly believe some of the reviews would be more positive. I do have one recommendation to offer to ensure a satisfying meal at Burdock & Co.: order a carb dish, like the ramen or risotto, for yourself and share the protein items. I know I definitely will be ordering the oxtail ramen for myself on my next visit. You really love your shrimps and prawns, don’t you? But then again, who doesn’t? The way they prepared the spot prawns sounds amazing, though I guess 6 pieces for that price seems expensive. But it is a seasonal dish after all, so I think it’s worth the price. Anyway, all of the food you and your friends tried looked delicious! I would definitely try Burdock & Co when I’m in the area. Thanks for your tasty and wonderful review!